If you like, you can consider this as a sort of bonus episode of the birthday albums project. Or, if you’d rather not, then don’t. Last week I was listening mostly to the new Shed Seven album, Instant Pleasures. Now Shed Seven, if you’re not familiar with them, were big around the time of Britpop, and while not necessarily at the forefront of the scene, I can definitely look back on them with fondness. They never had a number one, but the single Going For Gold, and the album A Maximum High from which it was lifted, both reached #8, which were their greatest successes. They split up in 2003 but reformed in 2007 and have been touring on and off since then, though this year’s album is their first since 2001. And you know what, it’s good. It more than meets the standard set by their earlier work, and so I’ve had no problem playing it on repeat all last week to make sure that I’d be well-prepared for their Saturday night gig at Brixton Academy. 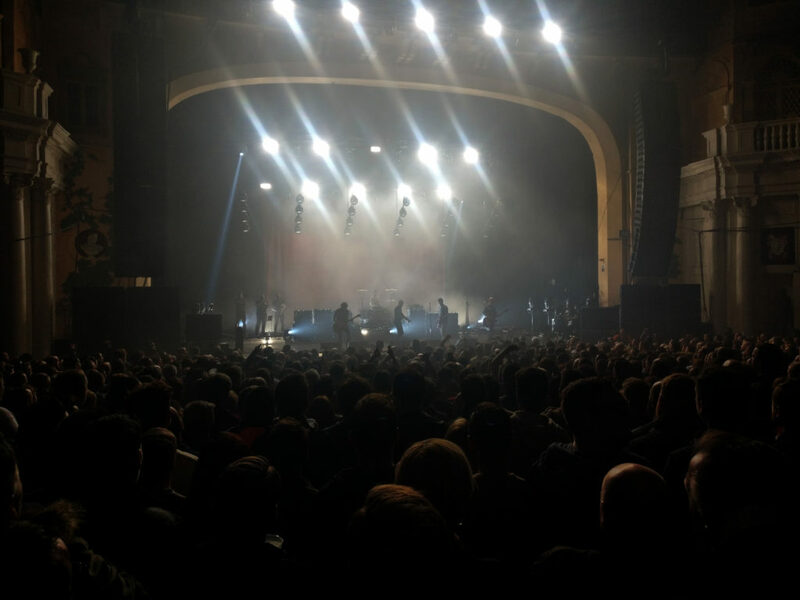 It’s been many years since I’ve been at Brixton Academy but it hasn’t changed a bit. The foyer still gives you that theatre-esque vibe, and the interior still has that five degree slope that gives your hamstrings a good workout. 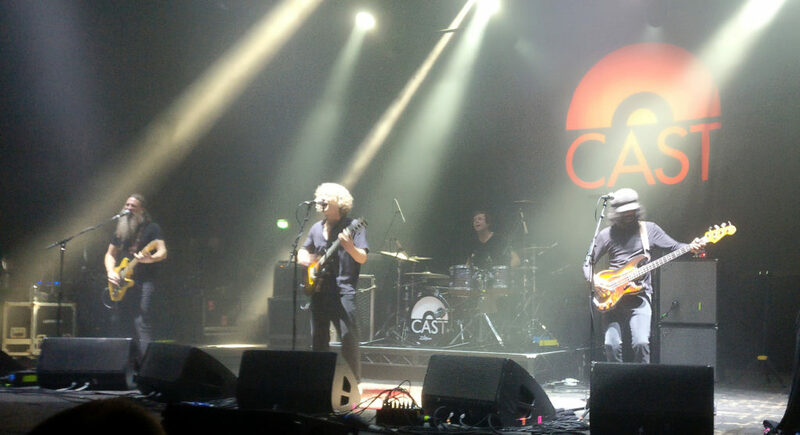 Playing support were another great Britpop band, who are also enjoying a bit of a resurgence with a new album this year, Cast. In fact, it’s slightly odd that Cast were supporting and not the other way round, as arguably they were the bigger band at the time. They had actually started playing by the time we arrived, as we had dallied in Canova Hall for a second round. It’s depressingly frequent these days that the sound mix for the support band is awful, and Cast might have been the worst victims of this that I have ever, ever known. All the power of the PA was being poured into making the kick drum as loud as possible, so there was no room left in the lower half of the sonic spectrum for anything else. I can’t state with even a single percentage of certainty that the bass guitar was plugged in at all. I moved down to the front in the hope that I’d be able to get a better mix with the sound bleeding off the stage, but even at close range, the kick drum overpowered everything. I felt embarrassed for the sound man, and great pity for the band. Shed Seven sounded much better, though I still think that with a lighter touch on the kick, they could have sounded even better. I didn’t take any photos from the down the front, though I did get hit by a flying drink while I was down there. I’m not quite sure what was in the cup – with no noticeable aroma, I’m totally stumped. However it can’t just have been water, as it definitely made my hair go a bit crunchy. This is a mystery that we may never get to the bottom of, and maybe that’s for the best. The band put on a good show though. Rick Witter has just the right balance of cheekiness and friendliness to bring a smile to your face, and his singing was on point. The whole band performed excellently, though once again the sound balance ruined things slightly, as I know that there are loads of really tasty basslines on their latest album, and absolutely none of that detail was even remotely audible in the room. After the gig, 5000 people spilled out into the streets, repeating the chorus of the gig closer, Chasing Rainbows, ad infinitum. I leaned casually against the bus stop and waited for the 345. I didn’t take any photos of that bit, more’s the pity. I also bought the last chicken and chorizo pasty at Clapham Junction station at about 11:45pm and it was surprisingly tasty. Never satisfied, you are. Well, here’s the thing. I think I’ve found an album that I was given for Christmas about two years ago and somewhat embarrassingly totally forgot to ever get around to listening to. So, in the interests of padding out this series (and hey, maybe this’ll take us right up to Christmas, and I’ll get more CDs, and the whole jolly thing can just keep on going forever) let’s listen to What Went Down by Foals.